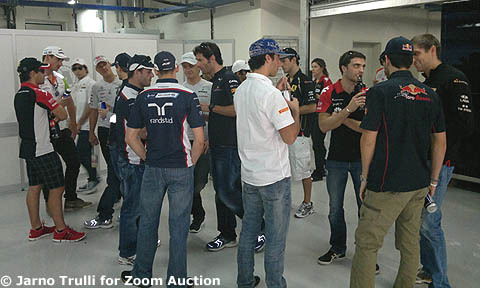 Over the past week Pitpass has been reporting on Zoom's upcoming auction of signed photos taken by every Formula One driver and team principal. It is in aid of a highly admirable cause as the proceeds will be given to Great Ormond Street Hospital which is the official charity of the British Grand Prix and has a close connection to F1 as the annual pre-British GP party is also in aid of it. F1 is leading the way here as this is the first time that there has been an auction of photos taken by the stars of any sport. It is hard to think of many other initiatives in F1 which have the support of all the drivers, all of the team principals and the sport's boss Bernie Ecclestone. Indeed, it is so attractive that even former drivers are getting in on the action. Yesterday Pitpass revealed that former world champion Mario Andretti has taken a picture of a fleet of Ferraris parked outside his vineyard in California. Today Pitpass has another exclusive - this time from former Team Lotus driver Jarno Trulli who also happens to own a vineyard. However, instead of supplying a photo of his hobby, Trulli is offering for auction a picture he took which gives an insight into the day job of an F1 driver. The image shows a gathering of drivers casually chatting before the pre-race parade at last year's inaugural Indian GP which was one of Trulli's last F1 races. Here at Pitpass what we love about the picture is that it shows how the drivers have formed groups to chat and whilst some are adorned with their team caps, others look more relaxed. Look out in particular for the wonderful tartan-like shorts worn by Timo Glock. The signed photo is one of 50 in the auction and fans who want to bid for them should keep an eye on the Zoom website as well as its Twitter and Facebook pages, while Pitpass will be publishing more of the Zoom images exclusively over the next week.